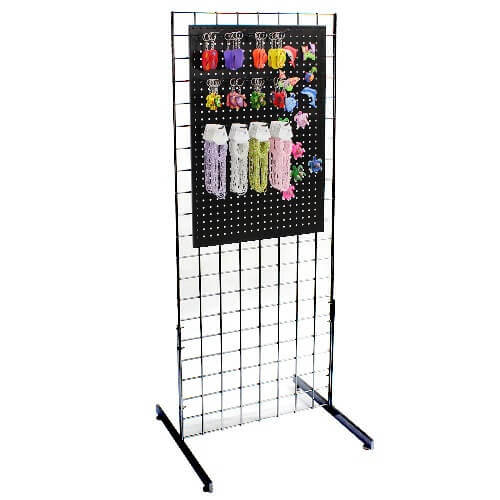 Our black Metal Pegboard Magnet Grid Wall Display is a sturdy and dependable grid panel with legs and not one, but two metal pegboard displays. Add impulse materials such as souvenir magnets, school spirit stickers that are magnetic, and other themed materials you may collect. The magnets stay firmly on the display with no slippage yet are easy to remove when purchasing. 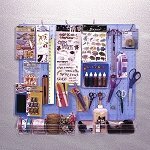 Switch things up on the two boards and add various lengths of metal peg hooks and showcase materials such as carded jewelry, key-chains, candy peg bags, snacks and so on. 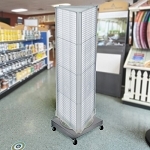 Display a wide range of merchandise on this free standing display fixture. Your customers will love the easy access this freestanding floor fixture has to offer. Displaying possibilities are endless on this stylish black powder coated steel floor fixture. Purchase your magnetic pegboard stand today to save yourself time and money!